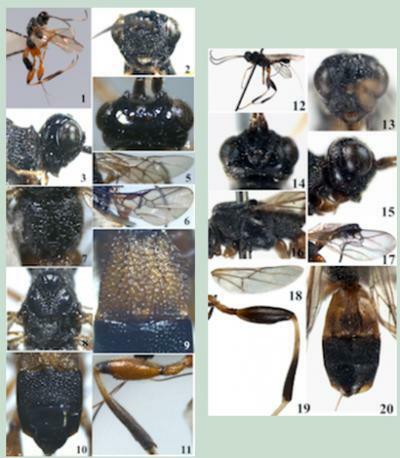 Wasps in the genus Spasskia (family: Braconidae) have been found for the first time in China, including a species in that genus which is totally new to science. The new species, Spasskia brevicarinata, is very small — male and female adults are less than one centimeter long. It is similar to a previously described species called Spasskia indica, but the ridges on some of its body segments are different. The species epithet brevicarinata reflects a short ridge on its first tergite, as "brevi" is Latin for short and "carinata" is Latin for ridge. The genus Spasskia Belokobylskij, 1989 (Hymenoptera: Braconidae: Helconinae) is reported for the first time from China. Two species, namely Spasskia brevicarinata Yan et Chen sp. n. and Spasskia indica Singh, Belokobylskij et Chauhan, 2005 are described and illustrated. A key to the species of this genus is updated to include the new species.